Are you in search for the Best Earbuds Under 50 Dollars? Well... Let me get it straight. This is your go to guide if you want some of the best in ear Headphones under $50 price range. See I'm not a fan of big corporate audio brands​, hence you won't be seeing any of the headphones from Skullcandy, Sony or JBL. This place is for pure audio enthusiasts who wants to get every bang for their every buck paid and great piece of sound. Hence without wasting more time... here's Top 18 Best Sounding Earbuds to blow your mind. Hence without wasting much time... let's get started! Klipsch is a brand highly synonym with high quality audio devices and has its sound quality better than its price range. Available in multiple colors like: Black, Blue, Green, Red and White, the Klipsch S3M is one of the cheaper and affordable in ear headphone under $50 from the audiophile brand. Unlike other Klipsch earbuds, priced over $50 have great build quality, however you don’t get to see that with the S3M as it comes in a plastic body and that is where the brand is cutting corners. Though priced under $50, there isn’t anything much to complain about it other than the plastic has glossy finish on the outside. Nevertheless, the brand is known for its sound quality and we’ll focus on that for the better part. It’s shocking to see that the plastic enclosure of Klipsch has a 5.8mm driver inside that makes the earbuds almost weightless and since when you wear these with Klipsch’s own eartips, you just don’t feel them in your ears at all. However with a driver as small as 6mm, I’ve found that these earbuds aren’t able to deliver higher spectrum of details in sound. Compared to earbuds that come bundled with your smartphone or MP3 players, the Klipsch S3M are way better, however the small driver though being good; sounds a little too recessive. I personally love listening to rock songs, and the S3M delivers a better sound quality compared to cheaper earbuds. However they’re sufficient if you listen to any kind of genre other than rock. They happen to have tight bass performance that sticks and rumbles right through our ears and gives a sense of audacity. Usually the provided eartips with any IEMs under $50 don’t happen to be good, however the ones provided by Klipsch provide ample amount of noise isolation cutting down majority of ambient noise. 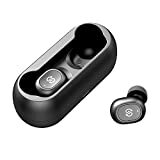 To be honest, it’s hard finding good Wireless Earbuds that are cheap and offer very good sound quality, there are plenty of knock offs available, and multiple earbuds that do not work as marketed. Since the ‘wireless earbuds under $50’ market is filled with large number of products, we did happen to find a gem among them. The Senso ActivBuds have over 4,300 customers reviews and a rating of 4.5 stars out of 5. Trust me, maintaining that kind of star rating combined with so many customer reviews is very hard, and hence why Senso ActivBuds are an excellent pick for best earbuds under $50. 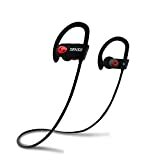 …and since they are Waterproof too with IPX7 rating, you can take them swimming or won’t have to worry about sweating in gym using these earbuds. It comes with a 80mAh internal battery that offers play time of 8 hours and takes around 2 hours to get fully charged. Sense ActivBuds comes in a simple box packaging, with the earbuds stored in a rigid round zippered storage pouch. Inside the pouch, you get the earbuds itself along with two pair of extra eartips and a small USB cable. Moreover the package includes bonus items like a dual-USB car charger and a 3 ft. High Quality Cable that supports both Apple’s Lightning Connector and micro-USB port too. The design too of Senso ActivBuds is similar to Beats Powerbeats 3, however the ActivBuds are durable and 4 times cheaper than Powerbeats 3. This In Ear Wireless Headphone under $50 offers a very good sound which matches to its pricier counterparts in a head-to-head comparison. Tweedz Braided Earbuds are a funky looking in ear headphones to say the least. In a very short time they’ve got notoriously popular for its colored braided cable design. Super Powers. Customers love the long wire, hi-fi sound with deep bass, & bold colors for adults, boys, & girls. And some have even said the braided cable is virtually pet proof. And best of all - affordable - under $30! Braided cable isn’t a new thing, however the brand happened to add a touch of style to it. Before I talk about the earbuds themselves, let me give you a small overview about braided cables themselves. Unlike Plastic and Rubber cables used for earbuds, braided cables are proportionately different from them. The former cable materials are bound to get tangled when you keep them in your pocket or backpack. Once you pull them out it takes about 2-3 minutes just to untangle time. Braided cables on the other hand is multiple nylon strings knitted together to form a strong cable altogether. This cable then happens to instil high strength and durability, and also happens to make the entire cable length tangle free. Though they’re not 100% tangle free, however you don’t need to struggle with them to entangle; as it takes only mere seconds to get them straight. These come in variety of colors and that includes: Black, Grey, Blue, Black & Gold, White & Gold, Green, Pink, Neon, Yellow and Red. Out of these multiple colors, I personally love the Blue one as it looks rich and has got some extra style to it. Talking about the earbuds themselves, for the price; they come in a Blister packaging and the package contains the earbuds themselves along with two extra pair of eartips. Tweedz Braided Earbuds are made of plastic and happen to be extremely lightweight. Once inside your ears, they’re hard to fall out. Sound quality wise they’re very well balanced and you can listen to almost every type of song genre in your playlist. Included earbuds offer excellent noise isolation and reduces outside ambient noise by multiple notches. ...however when I got to know more about it, it was obvious that this one was going to have its place in here. Well, Zero Audio Carbo Tenore is partially made up of Carbon fibre material. If you don’t know much about Carbon Fibre; then check here. In layman’s term, Carbon Fibre is an extremely strong fibre material that happens to be lightweight and extensively used in F1 cars which reduces their weight to almost 600 kilograms. Anyways let’s move back to the earphones and quickly talk about what’s inside the box. It comes in a blister packaging which contains two extra eartips of different sizes and a small draw string carrying pouch, with nothing fancy whatsoever. 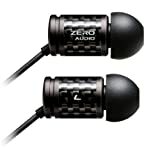 Talking about the Zero Audio Carbo Tenore’s design, it’s very small and the carbon fibre construction reduces its weight considerably, allowing the earphones to feel weightless and not fall off from your ears. One thing however I’m not fond of is the overall construction of the Carbo Tenore. For its USP, it sounds great that these are partially made up of Carbon Fibre, however the overall construction is slightly degrading. The cables happen to be thin and the wire running towards the audio jack may snap off if not used carefully. However considering its price, these headphones do happen to sound neutral. There’s no over powering bass or extensive rumbling of treble. It sounds kind of flat and for such a price happens to be an excellent proposition. 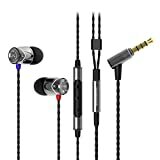 If you want to go Wireless and are looking for the cheapest and best in ear headphones under 50 Dollars, then you really won’t be disappointed. With 3.8 stars out of 5 and almost 7.300+ customer reviews, Soundpeats Qy7 is the most popular Wireless Earbud out there. Since so many people can’t be wrong and with such great rating, it’s worth giving a try as for the cheap price the company is offering. The box in which it comes is very small that fits on the palm of your hand. Even for the price of $20, the brand is generous enough to offer a small semi rigid shell case with it. You even get a user manual that instructs you on how to use these earbuds and get them paired with your smartphone. Inside the case, you’re greeted with the wireless earbuds themselves and three different designs of earhooks with various shapes and sizes. Also you have a small USB to micro-USB charging cable to charge these cheap earbuds. However I’d also like to mention that the Soundpeats QY7 comes in different colors: Yellow, Red, Green, White, Black, Blue and Purple. Once you get these in hand, you’ll be surprised to see how much of a small footprint these earbuds have compared to full-fledged wired earbuds. They’re small and come with a tangle free flat cable design. You get Bluetooth 4.1 technology on these one that allows you to enjoy low-latency skip free music while you’re on the move. On full charge the battery lasts between 5-7 hours and takes an average of half and hour to charge it fully. "If you ask me then I’d surely recommend it to someone who needs a Wireless and best in ear headphones under 50 Dollars that are so unbelievably good to resist considering the small price you’re paying for such a good sound." Symphonized is one of those brands that has risen from the ashes and in a very short span of time made a strong hold in the budget wooden-build in ear headphones segment. Considering most of its earphones cost along the line of $25, they happen to be easily accessible for general audience; who require an earphone for daily listening without much fuzz. DESIGNED WITH COMFORT IN MIND: The XTC earbuds have a larger wooden housing, perfect for those looking for a fuller fit and sound. They come with three sizes (S/M/L) of custom comfort fit silicone ear tips so you can be sure to find the perfect fit to optimize your noise-isolation. An eco-friendly carrying pouch is conveniently provided so you can safely store your buds when not in use. PLUG AND PLAY: User friendly, our XTC head phones are designed to plug and play. Easily pause/play, answer/end calls, activate voice control and skip tracks with an inline remote and microphone. Symphonized XTC fits the bill perfectly considering that at such a cheap price; it’s made of wood and comes with braided cable that will work well in city environment and stand the test of times. To be honest, there’s nothing fancy in them or a feature that would separate them from a sea of other budget earbuds. ...however they happen to be an exception considering its design compared to other budget friendly counterparts mentioned in this article. Even for the frequent caller there’s an inline microphone; however void of any buttons, hence to pick up calls you’ll definitely need to take out smartphone from your pocket. Coming to the sound quality; they definitely justify their price, while there’s nothing much that will blow your head off... it does come with a plenty of punchy bass. This will definitely help you to enjoy modern music pertaining to Hip Hop, Rap and Pop music. If you’re planning to gift someone a nice pair of best IEMs under 50; Symphonized XTC would make a nice choice. If you have idea about pro-studio audio headphones, there are chances you might have heard about this brand called Denon. Based in Japan, the company is well known for producing high-fidelity professional sound equipment that has also started to put foot in consumer-based audio devices. The brand is synonymous with high quality audiophile grade headphones. Denon AH-C50MA though being priced under $50, isn’t something that we’re used to seeing in this price range. The earbud's build using machined metal, and wires are made of high strength rubber that helps in longevity and durability. Though for the price they’re offered at, the packaging isn’t too fancy at all. You get three extra eartips in various sizes along with a converter cable so as to add additional support. However Denon doesn’t not provide a carrying case for these ones, it could be a deal breaker as an extra carrying pouch costs around $5 more. Leaving everything behind, let’s talk about the earphones themselves. Unlike other earphones I’ve seen, cable thickness on Denon AH-C50MA is twice as much I’m used to seeing. This gives its high strength, and silicone coating on top; gives it a tangle-free design. Denon AH-C50MA is available in two colors: Black and Silver. Out of these the silver ones look amazing and modern. These have an inline microphone that has one-button remote control that carries out functions like Play, Pause, Talk and Hang Up. Inside the earbuds we have a small 9mm driver that is capable of producing an almost flat sound. These happen to have ample amount of bass and works effortlessly in the mid and high range. Don’t expect them to throw out thumbing bass by adjusting the equalizer, if you want something to put out good amount of bass, you can go out with Brainwavz Pro Alpha Earbuds. For the price, they sound much better and have a flatter response compared to other earphones in our list under $50. If any one brand that knows a lot of things about audio products, then it’s surely Sennheiser. This German company has many audio innovations under its name, has a strong hold in the market and produces excellent quality audio products that we’re all fond of. Sennheiser CX 3.00 is newest model from the CX series. No matter how odd the name is (I hate it), you do get a good looking and one of the best in ear headphones under 50 Dollars, isn’t it? Outside the box, the Sennheiser CX 3.00 comes within a clear plastic case... the ones we’re used to seeing Apple Earpods come in with. Along with that you get three more extra silicone eartips and thats it. Coming to the earbuds they have an angled eartip design which allows them to adjust to the cavity of our ear. However with my experience; such design isn’t able to provide optimum comfort because everyone’s ear isn’t designed the same way and creating an ergonomic design like this doesn’t offer a universal fit. 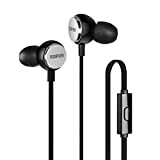 The earbuds are made out of plastic with extremely good built (very normal from Sennheiser) with chrome finish at the back with engraved Sennheiser logo. That thing does add a small glitter to the earbud and gives a cool look for the dull full black design. You get long cable at 1.2m and don’t get confused as this model doesn’t have a mic. Connector on Sennheiser CX 3.00 is right angled and easy to use. As it is with all Sennheiser in-ear headphones, you have a warm and balanced bass sound with CX 3.00... so there’s not much of a transition in terms of sound if you’re switching from an older Sennheiser earbuds to this one. However you do feel the sound quality improvement Sennheiser offers if you’re switching from some other cheap priced brand to this one. "With Sennheiser CX 3.00 you can be 100% sure that you’re getting a strong plastic built earbuds with a basic design but with a reliable sound and hence it’s featured in our list of best in ear headphones under 50 Dollars." Very recently I had featured Edifier’s uniquely designed Luna Eclipse Speakers in our list of Best Computer Speakers under $200. With that kind design, you’d know how crazy the brand can go to deliver a great audio product for the masses. Edifier P293 is no exception to it. It comes with an angled eartip, flat cable design, and multiple perforations at back of the earbud that gives way for a more open sound. We’ll get to earphones in a minute, just before that I’ll give you a clue about what’s inside the box. These come in a small square like box having two windows, giving glimpse of the two earbuds. Inside the box, we have the earphones themselves along with multiple accessories. For a price of under $50, you get a small carrying pouch, two extra sized eartips, a shirt clip and a converter cable that allows you to connect it to your laptop/PC. Being priced under $50, the accessories that which it comes with is extremely good. Coming to the earbuds, they come in two colors: Green, Black and White. Green looks a bit too bright, and hence I recommend going with the black or white one. The back I believe is made up of metal (however I’m not too sure) and has multiple perforations along its side. This allows more passage of air in-and-around the earbuds that helps it delivers an excellent soundstage. The music happens to feel livelier and broad with such kind of design. Edifier’s P293 product page on Amazon claims that these have audiophile sound; however they don’t; and have more emphasis on the bass as well as treble. It’s definitely a earphone for the masses but of much better quality in terms of sound and built quality. To be very honest, earlier I hadn’t featured any of 'House of Marley' audio products because I never ever had a chance to play with them. Though I did hear a lot about the brand and their reggae styled audio products, and Zion is the one product from the brand that I got hands-on with and here’s it is in our list of Best Earbuds under $50. Before I talk about the earbuds themselves, let me inform you that even at a price of less than $50, the brand hasn’t compromised on anything. Right from the packaging, to inside content, earbuds build quality, to boxed accessories, everything is top notch and of premium quality. House of Marley Zion comes in an eco-friendly recycled box and the brand supports 1Love.org, which means some part of your purchase will be to donated to the organization. Inside the box we have the earbuds themselves along with four extra silicone eartips of different sizes. Moreover you get a highly premium and authentic canvas and leather built carrying pouch and couple of instruction manual. 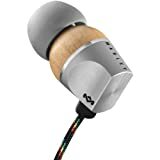 House of Marley Zion earbuds are made up of two different material, the backside where the wire connects is made using metal, while the front is constructed with wood. This gives it a unique look and style that helps its standout compared to cheaper plastic earbuds or even the metallic ones. You also get a three button remote with an inline microphone, which is of high quality too. It’s cables have rasta styling and are braided, which helps in strengthening the overall built. House of Marley Zion also include couple of double-flange eartips so as get a better sound isolation. The overall cosmetics looks extremely good, however since they cater to an audience that loves boomy bass and mostly listen to hip-hop and rap, sound detailing is thrown off guard. Well if the previously mentioned Soundpeats QY7 weren't impressive and you're still searching for a cheaper Wireless Headphones but from a renowned brand and better built quality, then there’s nothing better than Brainwavz BLU-100. The company has been well known for producing great quality products at ultimately cheap price. Their range of in-ear headphones like M1-M5 have been a huge hit one after the other and I myself own one of BrainWavz Earphones in my personal collection... hence this is the one brand I'll recommend to anyone looking for Best Earphones under 50 Dollars. Design wise... you have a hammer like earplugs on these one; which make them look so much better and different as the extra part has to house the Bluetooth circuitry and battery itself. Still the design is much better and sleek compared to the bulky and non-inspiring design of Soundpeats QY7. Hence if you’re looking for class, you’ll find it here. Though the built is entirely plastic, the overall construction is pretty solid and the Neon accents on Eartips and mic make it look uber. Since it offers Bluetooth 4.0 with APTX technology, sound quality on this one is similar to the one you get on a wired earbuds. Even the wire length on this one is long and large which puts the mic near your cheeks rather than behind your neck that results in voice not being heard during calls. Best thing is the package that it comes with. You get a small semi rigid carrying case along with Small and Large Neon accented Eartips and there’s also one set of Comply Eartips so as to enjoy songs with complete noise isolation. "All in all the Brainwavz BLU-100 are an incredibly smart and uber looking Wireless Earbuds and hence are featured in our list of Best In ear Headphones under 50 Dollars. That too for such a cheaper price!" No matter what, there are certain kind of people who are bass heads and want tons of bass in their songs... even when the composer didn’t intended to add bass... these type of people want bass there too. Well, just kidding. ...they usually overshadow all the other elements in any kind of music by applying false bass and coloring the entire song in a different way. However still Bass is the only thing in a song that can be actually felt and we respect the choice of Bass Heads and hence we’ve included a more bass centric best earphones under 50 Dollars. The Sol Re﻿﻿﻿﻿public Relays are meant for Gym centric use and hence they have a sweat and water resistant design. They come in a small and attractive packaging, you can see them out from the box towards its side kept behind a blister packaging. To my surprise I had the most easiest experience in unboxing the Sol Republic Relays, once you cut the outer tape; with one push the entire headphone package is out without you requiring fiddling a lot. Inside the package you get a very small carrying pouch along with 4 different size of ear tips. I did had a slight problem getting these earphones in my ears since it didn’t had a stem towards the end of ear plugs... and I dunno why; I always have problem wearing earbuds that don’t have a proper stem. Once on, the sound is what you’re going to enjoy. The fit is very comfortable and can be easily used in gym and workout session. "If you want the best in ear headphones under 50 Dollars that offers good bass without overpowering the entire song; then the Sol Republic Relays are your best bet." Phiaton relatively is not a well known audio brand, it was launched in 2008 by Cresyn Co. Ltd and happens to sell high quality and professional range audio devices. Warranty: Continue to enjoy your bluetooth wireless device long after the Amazon return period expires. All Phiaton bluetooth wireless products come with a One Year Warranty and we stand behind all of our products with US a based customer service. I personally find earbuds released by Phiaton to be fancy and superbly eye catching. Phiaton’s MS 100 BA is no exception either. BA in its name stands for Balanced Armature, and for a price of $50; they’re the only earbuds in our list of Best Earphones under $50 to feature Balanced Armature design. Unlike normal earbuds with dynamic drivers featured in this list, Balanced Armature earbuds have an altogether different kind of design. I’m not going to go deep into the BA science. However if you want to know more, you can have a look at this video here. To put things in perspective, one of the most reliable Balanced Armature earphone we have right now in Sony XBA-H1 and it costs around $150, has two-way BA drivers and still lacks in bass. However Phiaton MS 100 BA has right amount of bass with only one BA driver unit and how did they manage to pull that kind of bass; is sort of surprise though. To be completely honest, Phiaton MS 100 BA surprises me in multiple ways. Being priced under $50 and coupled with Balanced Armature driver, the earbuds are designed using aluminum alloy metal. Even the connecting cables have an oval-like design having silicone covering, which makes them almost tangle free. The inline microphone too happens to look sleeks and blends in with the design, however it only has one button and can be used to Play/Pause music and Receive/Hang calls. Inside the box you get a small felt-like draw string carrying pouch to store the Phiaton MS 100 BA, moreover you get three extra silicone eartips that happen to be color coded from inside and makes it easy to distinguish between Extra Small, Small, Medium and Large sizes. RHA brand is highly synonym with building rigid quality earphones and all of them have aluminum housing, no matter what the price range. 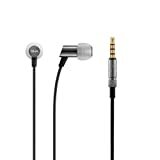 RHA S500 is the cheapest in ear headphone under $50 from the brand and has aluminum housing too. Let us see how this earbud stands out compared to the other pricier models. No matter how cheap the price is, the company’s motto of providing high quality products follows along with the box too. For under $50 you get the RHA S500 in a brilliant package that increases it perceived value by multiple folds. Inside the box you get the earphones themselves along with 6 other set of silicone tips coming in various shapes and sizes. You have one double flange eartip too. Moreover you get a draw string carrying pouch and set of instruction manuals. Just like their previous iteration of high quality in ear headphones, RHA S500 stands up to that quality standard. You don’t see any kind of compromise anywhere when it comes to build quality. The earbuds are carved out of aluminum alloy that gives it a robust finish just like the RHA T10i and RHA T20i. Upper part of cable is made up of high quality rubber material while the latter part from mic towards the 3.5mm jack has been constructed using braided cable. Even the 3.5mm jack holder is constructed out of rigid aluminum alloy just like we’ve seen in RHA MA750i and so. Pictures may not justify the size of S500, however in reality they’re extremely small and lightweight. Inside the small aluminum construction sits a tiny 6mm driver that does all the wonders. Sound quality wise they have plenty of rumble and you’d to happy to the kind of music feedback you deserve. Other RHA earphones happen to have neutral sound, however the S500 has levitates in the brighter range. 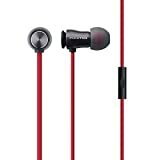 Don’t expect them to put of lot of heavier bass that you expect from Beats or Skullcandy earphones, and there you have a earphone that does justice to your music altogether. Soundmagic is a lesser known Chinese audio brand that manufactures some of the best in-ear headphones out there at an incredibly cheaper price. 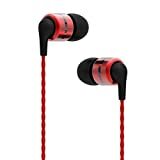 Soundmagic ES18 is regarded as the best in-ear headphones one can buy at an incredibly cheaper price by many online reviewers and audio experts. Even being a Chinese brand, it has been known to provide exceptional sound quality at dirt cheap price. E80 is the new iteration from the company for its E series range of in-ear headphones launched along with its small brother Soundmagic E50 as well. The packaging for E80 is very simple considering they’re one of the best in ear headphones under 50 Dollars and top-range model in the E-series range, and is almost identical to all of SoundMAGIC in-ear headphones packaging. 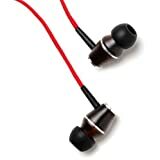 The Company has always been generous in terms of offering accessories along the earbuds and they haven’t spared a thing with Soundmagic E80. I just don’t remember the last time any audio brand including so many accessories along with an earbud that costs just under $50. Since it’s the flagship you can expect excellent build quality on it. The entire earphones are made up of pure aluminum, even the wires are twisted cables with glossy plastic layering over it giving them a tangle free design. SoundMAGIC claims the E80 to be a reference grade in-ear headphones meant for audiophiles, and I won’t be surprised if they say it so because the company always delivers. Get to know more about the SoundMAGIC E80 here. 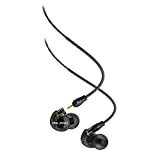 "It seriously doesn’t get any better than the SoundMAGIC E80 and I definitely feel they are one of the best in ear headphones under 50 Dollars that you can buy right now. So what are you waiting for? Go out. Buy one for yourself!" If you want a cheap and best in ear headphones under 50 Dollars with features that match headphones thrice its price then MEE Audio M6 Pro is your best bet. They come in two colors: Black and White, and have a clear case design allowing you to see the innards of this best earphones under 50 Dollars. Moreover there’s even detachable cable allowing you to detach the earplugs from wires with a propriety connection. You’re greeted with a large semi rigid carry pouch that contains the Comply eartips and variety of single, double and triple flanged silicone eartips. The earphones are kept separately and stored as barebones unit in the box. To my surprise the carry pouch provided is fairly large and also comes with a 6.3mm adapter which is unheard of when it comes to in-ear headphones under any budget. The company is also generous enough to throw in two connector wires: one with inline mic and another without mic. The inline mic has slider to control volume rather than regular volume up down buttons. MEE Audio refers M6 Pro as Musician’s In-Ear Monitors as they have complete balanced sound usually meant to be used while studio recording and critical listening. If you know little bit about different earphones and brands... One can easily tell that the design of MEE Audio M6 Pro look very similar to that of Shure SE215 which also come with detachable cable and clear case design. And just like it; the M6 Pro are meant to be worn behind the ear that allows it to have a snug fit overall. Its specifications include: 10mm drivers, 16 Ohms of Impedance and frequency response of 20-20,000 kHz. "The MEE Audio M6 Pro are a cheaper alternative to some of the most costly musicians earphone that offer more balanced sound for critical listening and studio recording. Sadly you won’t be getting a lot of punchy and extra bass... and they’re really not meant for that... Hence if you know what you’re looking for and need some of the most purest sound, consider going for the MEE Audio M6 Pro as they are one of the best In Ear Headphones under 50 Dollars." 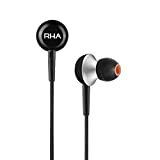 If you ever want to get your hands on best in ear headphones under 50 Dollars that have an excellent build quality along with good looks then RHA MA350 it is. Built out of aluminum the earphones are certainly of great quality considering the asking price. RHA has always been known for producing great looking and durable audio products. Outside the box you get the in-ear headphones themselves along with 2 more pairs of eartips and a small draw string carrying pouch. Once you hold these in your hands, you’ll be definitely surprised to see the kind of build quality you’re getting just by paying $40 or so for these. None of your friends would believe these to be costing under $50, since they look so premium and totally awesome. Headphone jack is gold plated, even the cable on this one is nylon braided and markings on these headphones are certainly so crystal clear making it feel like a par $100 in ear headphones. However I would have liked it more if the smartphone connector jack was right angled rather than a straight one, since the straight ones are more prone to breaking easily. Coming to the details and specifications, then you get a 10mm drivers sitting inside each ear plug that offer larger frequency of sound from 18Hz-22,000Hz offering impedance of just 16 Ohms... that means these are easily driveable off your smartphone. "With cost just under $40, aluminum built, nylon cables, 3 Years Warranty, RHA branding... the RHA MA350 were always meant to be at #1 position in our list of Best In Ear Headphones under 50 Dollars. They are almost everything you ask from a sub $100 in ear headphones and more. If you don’t need an inline microphone... just close your eyes and go on with these." Soundmagic E10S are the ones that started a big rage for other audio manufacturers to offer great sound quality within earphones under $50. Being awarded as Best In Earphones under £50 two years straight in a row (2014, 2015) by What HiFi magazine, makes Soundmagic E10S a desirable choice. To say the least, there are still very very few earphones that happen to stand alongside Soundmagic E10C. ‘S’ in the E10S stands for smartphone and every earphone model from Soundmagic that has ‘S’ in the suffix has an inline microphone. The version without microphone costs $5 less. The guys at What Hifi gave them 5 star ratings with no cons whatsoever, then who are we to object it. These come in two colors mainly: Black/Gunmetal and Black/Red. Both of these colors looks extremely premium and happen to be a good choice with whatever you go with. For the price, you get tons of accessories in the package; you get the earbuds themselves along with a strong and rigid carrying case, multiple eartips, shirt clip and a connector cable to connect them to your PC or Laptop. The cable on these one happen to be extremely durable, since they have twisted cable covered with plastic; which gives them tangle-free design. Coming to its sound quality, it’s extremely premium and an exception in its price range. Since they’re targeted at everyday usage and highly consumer oriented, you can expect tight bass response that shows it presence in every song you hear, it’s the kind of an earphone that happens to be a great companion for songs in every genre.